Building community: Catherine Love writes on a quietly radical performance, part of a series of public interventions by Common Wealth. Food has a way of bringing people together. We reach out towards the plate in the centre of the table, fingers clumsily brushing, looking up to exchange awkward smiles. We take bites, small and tentative at first, as though making sure that it’s allowed. And then, with each chew and swallow, a sort of ease starts to creep across the space, softening the gaps between us. Common Wealth know how to make communities. The onion bhajis that we share around tables throughout Radical Acts – crispy, delicious, with a little punch of spice – are the same “radical snacks” that have been bringing together local women every Monday lunchtime at Speakers Corner, the theatre company’s Bradford base, where this piece of performance was incubated. That sense of community, that shared vocabulary, sits quietly in the room. It’s hard to pin down, but there’s a certain openness, a certain generosity, that reaches outward to the audience. Water is poured from one cup to another, over and over. A chant is sung and signed, first by one voice and pair of hands, and then by many. Placards remembering the actions of women are held up, silently, without comment. I’m handed a package of earth and urged to plant a tree. 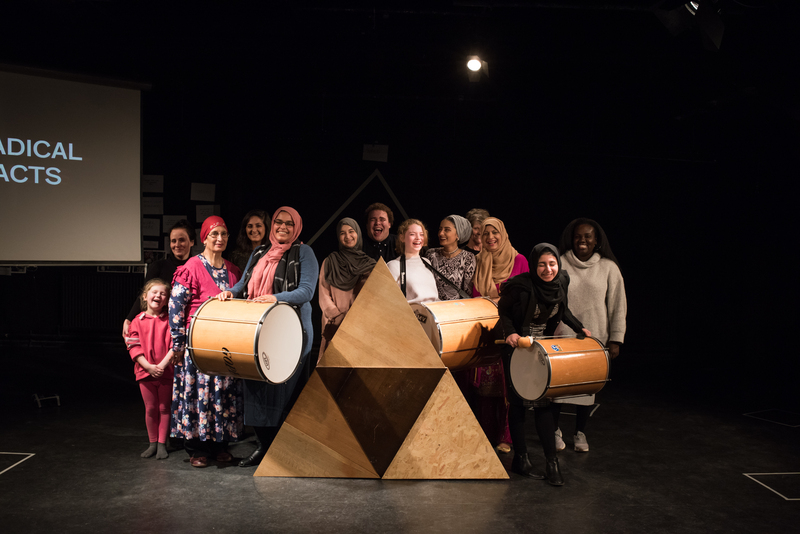 This performance element of Radical Acts – part of a longer series of public interventions in Bradford to mark the centenary of (some) women getting the vote in 1918 – carries with it a sense of ritual. The communal eating; the simple, repeated choreography; the re-enactment of history. The show is made up of gestures and words from the past – radical acts undertaken by women and girls across the years. “She led an army of 10,000,” reads one sign. “She poisoned the slave master,” declare the letters emblazoned on curtains at the windows. Alongside this history, re-made and kept alive in the grand surroundings of the Bradford Club, performers and audience together ask what it means to be radical today. The cast, nearly all of whom are performing for the first time, share their stories with a fierceness and generosity that’s hard to resist. There’s a sense, too, that they are in control of this process, giving just as much of themselves as they’re prepared to give. Their radical acts range from front-line activism to small but brave gestures of defiance, redefining ideas of protest and disobedience. Even to occupy this space, this space exclusively carved out for privileged men, and to fill it with the stories of women and girls – even that feels radical. Theatre-makers are fond of the word “radical”. Pretty much all contemporary practitioners claim that their work is radical, experimental, revolutionary even. Typically, that radical quality is sought in the aesthetics or in the big political statements. But the radical gesture of Common Wealth’s work also lies in the things that might go unnoticed, the things that seemingly have nothing to do with “art” but actually have everything to do with it – the administration, the working practices, the money. The most expensive tickets for Radical Acts are £10, while those on benefits can see the show for just £1 (crucially, without the indignity of having to prove their benefit status). Unlike the sometimes murky arrangements for working with “non-professional” participants, Common Wealth are absolutely transparent about pay: all performers have received £10 an hour for their time, paid in vouchers so that it won’t affect any benefits payments. There’s a simple care and an understanding in these choices that is as much a part of the spirit of the show as the stories it shares. At the end of the performance, there’s no rush to leave. The audience – which for once is almost as reflective of the city and the country as the wide range of women performing – lingers, extending the conversations that had begun over onion bhajis. It’s a reminder that radical acts don’t always have to be big or loud. Sometimes, they’re as quiet as two people sharing a meal and talking about changing the world. Radical Acts was staged at The Bradford Club by Common Wealth Theatre, from 19th-23rd September. More info here.